The FTD® Loving Light® Dishgarden is a ray of hope and a beautiful symbol of eternal life offered through our finest collection of plants. 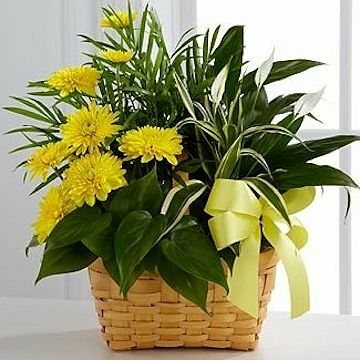 A palm plant, peace lily plant, dracaena plant and philodendron plant create an exquisite look when brought together in a 7-inch natural woodchip basket and accented with stems of bright yellow chrysanthemums. Adorned with a yellow satin ribbon, this gorgeous dishgarden will bring comfort and extend sympathy throughout the months ahead. Based on season and availability this selection may contain: an assortment of blooming white plants and green plants.